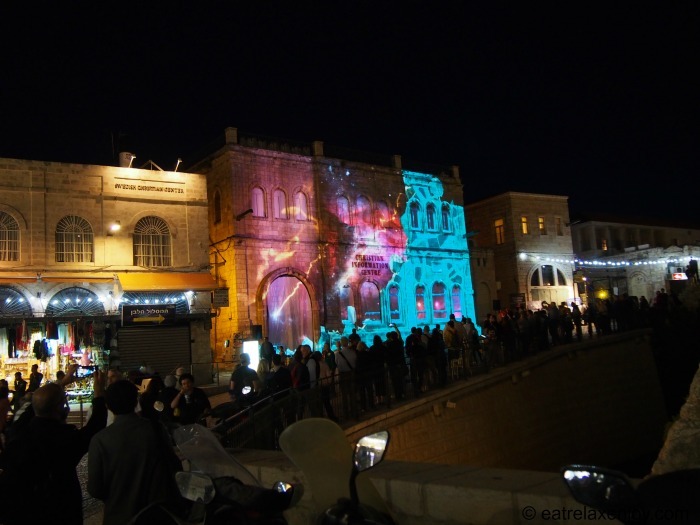 Jerusalem Light Festival 2016 takes place in the old city of Jerusalem on 25.5-2.6.2016. 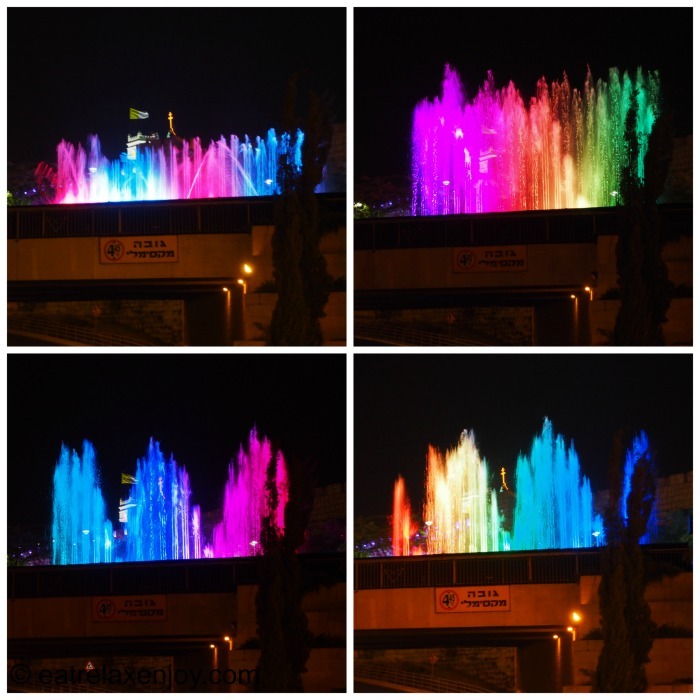 The festival is the 7th light festival in Jerusalem and this year a number of especially impressive installations are installed – a musical light fountains and a fire isntallation to represent that the opening date is on Lag Baomer. 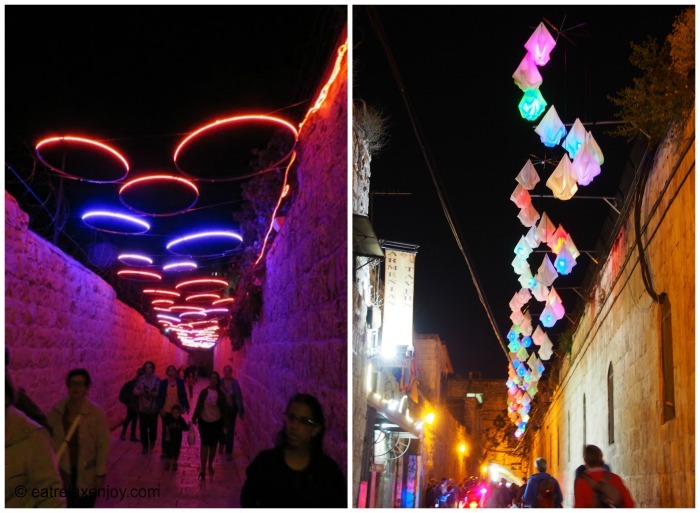 The art installations in Jerusalem Light Festival 2016 are organized along paths. I just moved around freely from one path to another. If you don’t know Jerusalem very well, I suggest you use a map. Free maps are available at the information centers and the paths are well highlighted, so it is quite easy to follow them. 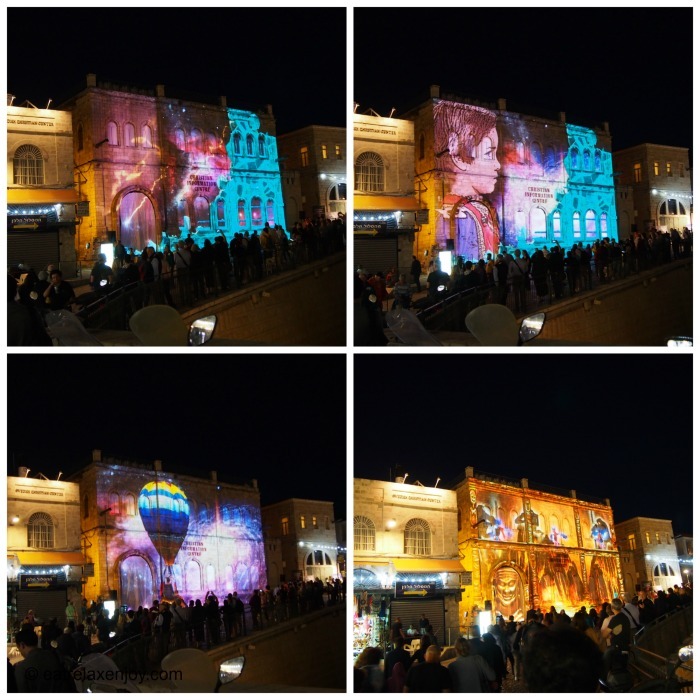 Here are a number of art installations in Jerusalem Light Festival 2016 that I saw during my own tour of the festival. These are only a small sample of the installations but I chose them to show how lovely this festival is. 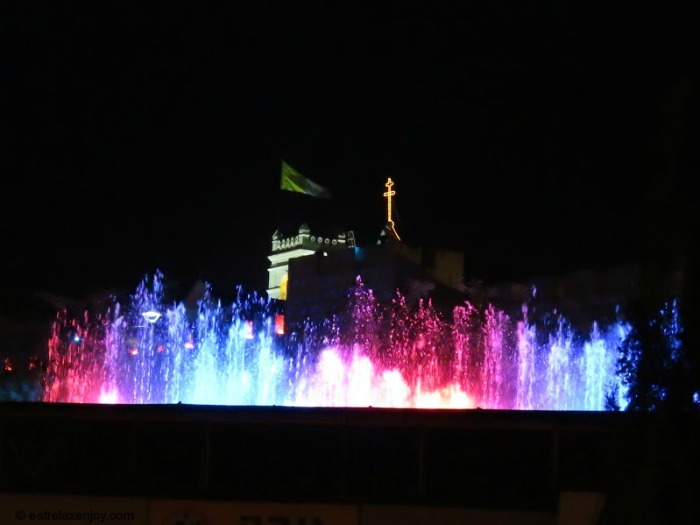 I’ll start with one of the highlights of the festival – the musical light fountains, located on the plaza of Jaffa gate. 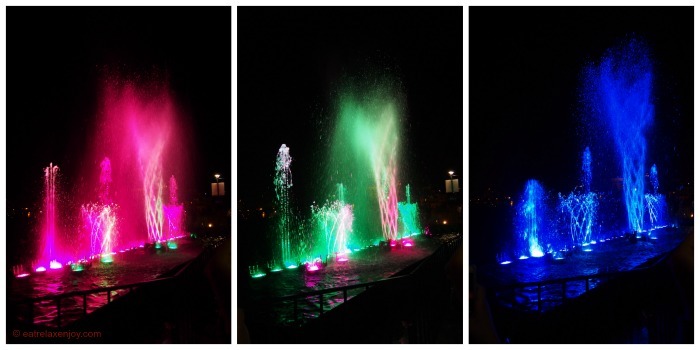 An orchestration of water, light, and music with excellent choreography creates a spectacular installation that will fascinate you for a while (installation 3, the white path). 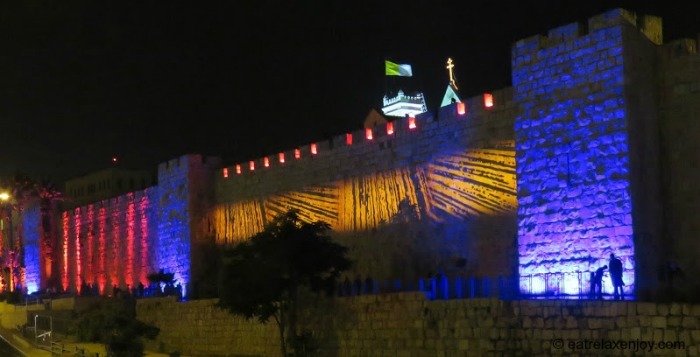 As you approach Jaffa gate plaza, the old city walls of Korov path are beautifully lighted (installation 1, the white path). The motive of using the old city’s walls and houses as canvas for the artwork is very common here in the festival. 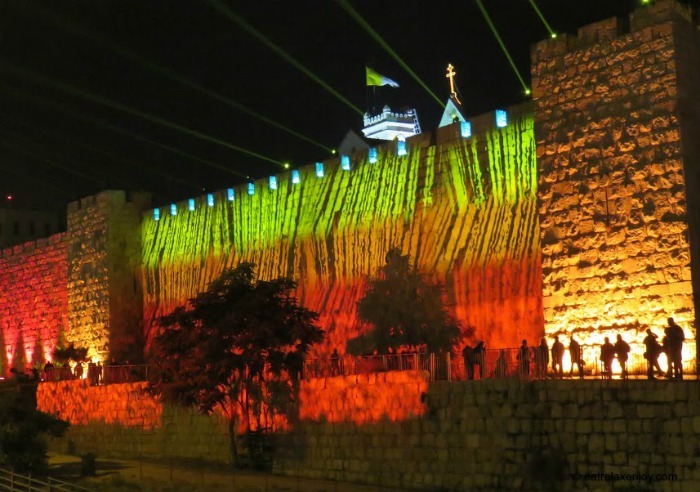 When we enter the Jaffa gate towards the white path, a movie is screened on the facade of the Christian Information Centre– a movie about the Prince of the Lights of a French artist (installation 4, the white path). The movie tells a story of the birds that swallowed the light and the prince that searches and finds the light using his persistency. As we walk in the alleys of the old city, we need to look up as well. There are installations that are hung over the plazas and the alleys. On the Armenian Patriarchy Street there is an installation of Colorful Origami (installation 5, the white path) – see the right hand side of the photo below. 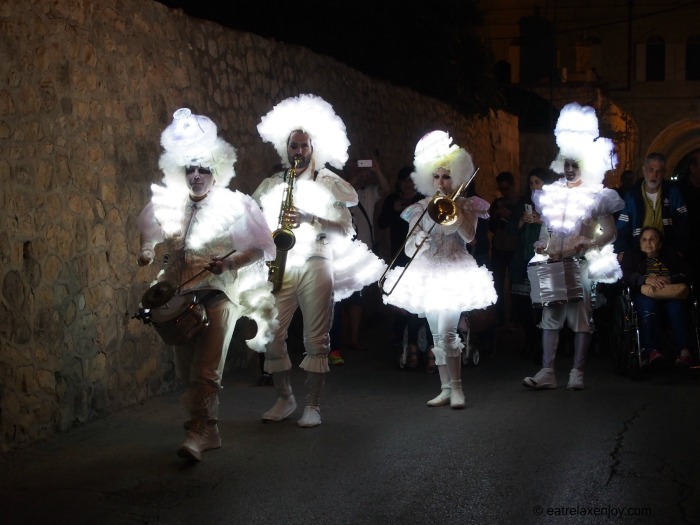 On the left hand side of the photo – an installation in the alley leading from the Dormition Abbey to the Bonim garden. 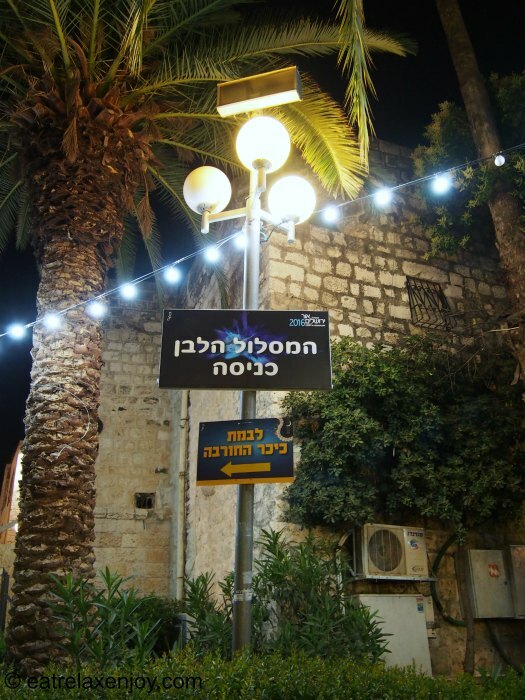 The pedestrian street of Yoel Moshe Salomon also has an upper installation of light balls. By the way, Yoel Moshe Salomon Street has a permanent hanging infrastructure and is known for having different art installations year-round. 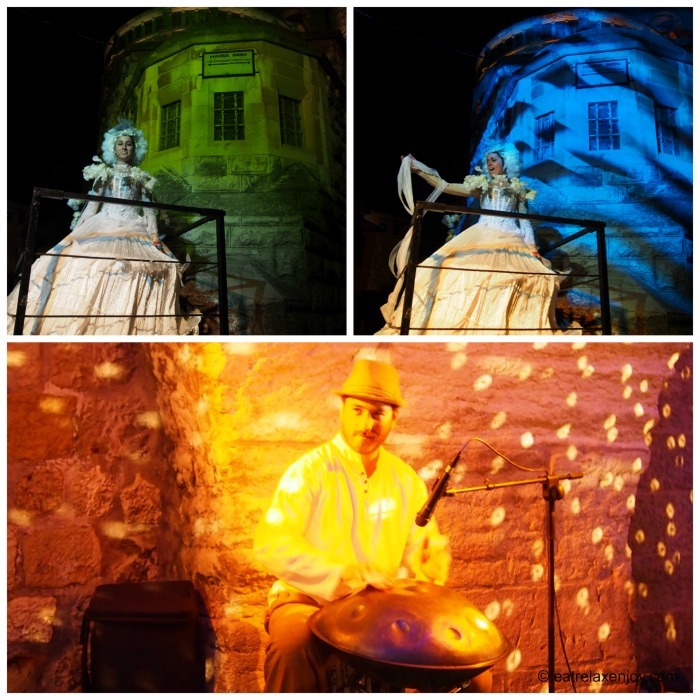 Among the installations there are also lights-enhanced musical performances. Near Dormition Abbey that is lighted with changing lights in a harmony of colors, there’s an opera (playback) of Pavaroti (installation 11, the red path). On the blue path, near the Muristan plaza, we watched a Pantam player (photo below, bottom). On the white path, we saw the musical orchestra on the move. In order to find one’s way, the festival maps are given for free and there are paths highlighted with colors. The paths are not only on the map – they are on the streets. It is easy to follow it. There are signs for each path entry and a wire of lights stretched along each path. For example, here is the entrance to the white path. See the white lights wire? Each path will have such lights but in different colors – green, red, blue, etc. all you need to do is follow the wire with the lights and you’re on path! And if we’re on the white path, the Hurva synagogue and plaza is there and presents an impressive installation of ‘Pictures in Motion’ combining a display on the synagogue wall with a robot holding a Plasma display (installation 9, the white path). There are also installations in the Kardo. The Tree of Light from Kabala there is quite nice (installation 21, the blue path). 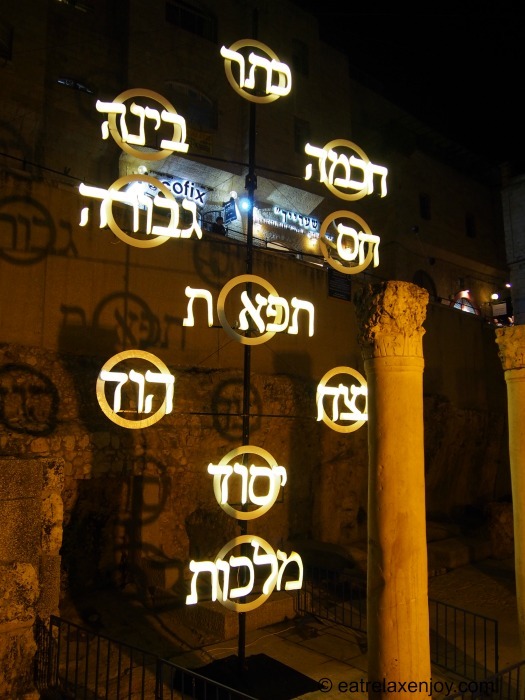 Most installations in Jerusalem Light Festival 2016 have a well-marked sign telling the story of the art installation in Hebrew, English, and Arabic. The photo below shows the installation on the Muristan plaza and the related post sign (installation 18, the blue path). 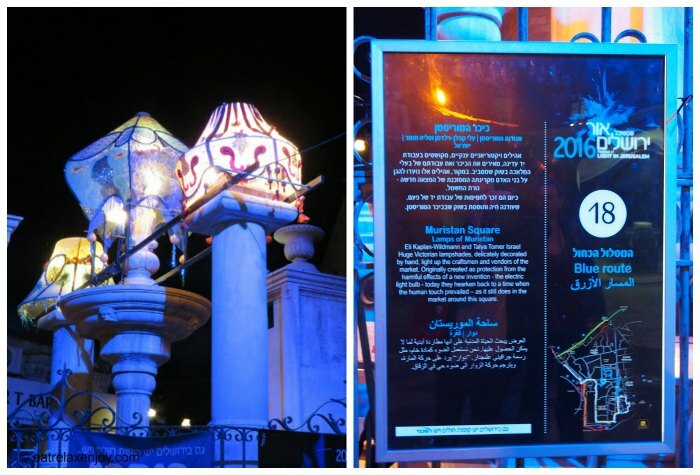 The Jerusalem Light festival 2016 features also dynamic installations and interactive artwork that interacts with the audience (for example, the bubble installation, number 12 in the Bonim garden, is an interactive installation), installations with fire (Tornado of Fire art installation number 24 on the Olive Tree Lawn) and other surprises such as free art workshops for children on Hutzot Hayotzer). You can easily spend the whole evening there and not see everything! 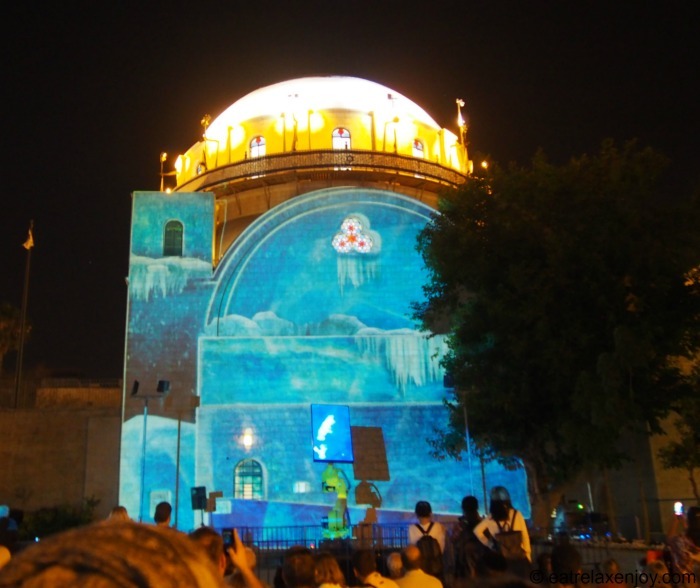 Information: Jerusalem Light Festival 2016, 25.5-2.6.2016 between 8-11pm. 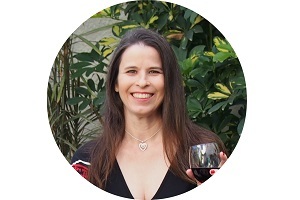 Tip: bring a sweater; it gets cold in Jerusalem at night.